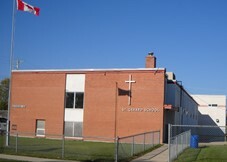 St. Gerard School is a Catholic School, part of the Archdiocese of St. Boniface. We are pleased to offer students a place where their faith can grow as well as a curriculum in accordance with the regulations set out by the Department of Education and Training by the Province of Manitoba. St. Gerard provides an engaging educational environment that fosters the spiritual, academic, social and emotional growth of it’s students. St. Gerard School is a place where students have the opportunity to participate in the Eucharist and learn in a safe, caring environment.